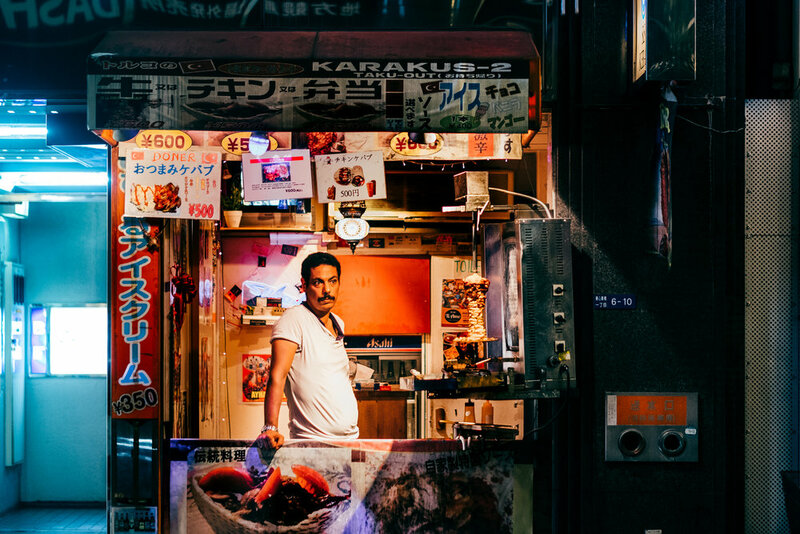 This review is based on a 11 day trip to Japan during which Fujifilm so graciously loaned me a brand new X-T2 including several lenses and the battery grip. 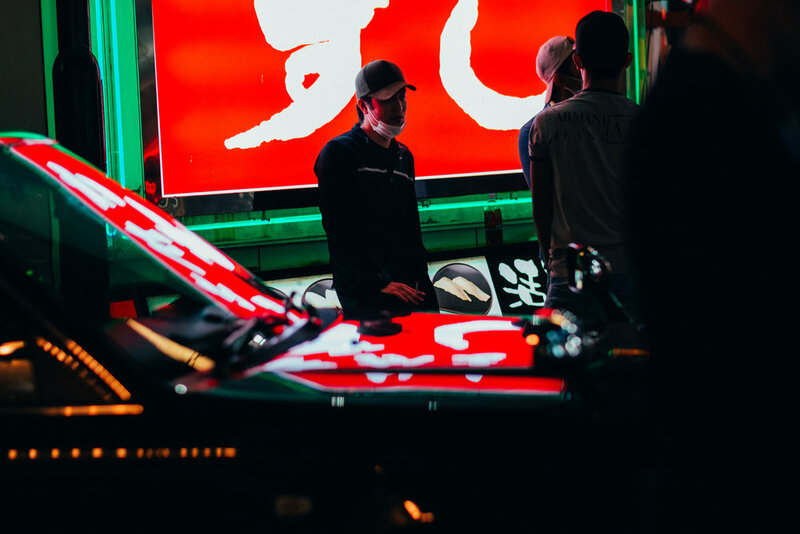 I was touring with Shortstraw and Desmond and the Tutus to document their music tour of Japan, going through Tokyo, Osaka, Nagoya and a quick stop in Hong Kong. My background as a director, photographer, shooter and editor meant that I was going to put the camera through its paces for both photography as much as video. With the exciting new addition of UHD 4K video recording in the arsenal of this camera’s offerings, it would be my focus to see how it holds up versus other cameras on the market and also the step up from the X-T1, which I have been shooting stills on since it launched in 2014. My love affair with the X-T1 has always been hugely influenced by its size and portability and its manual controls that made it feel (and look) more like a 35mm film camera. I still get asked all the time by people if it’s a film camera, and they’re always surprised when I turn it around and I show them the digital screen on the back. This remains unchanged with the X-T2, despite it being only a touch larger and heavier you receive a whole host of newfound abilities that quite frankly leave the XT1 in the dust, which is a HUGE testament to the Fujifilm brand for pushing this camera so far. I’ll go into more detail below. The autofocus, which was never really in competition to the bigger DSLR’s in the X-T1, is now lightning fast with the X-T2. A huge step up. 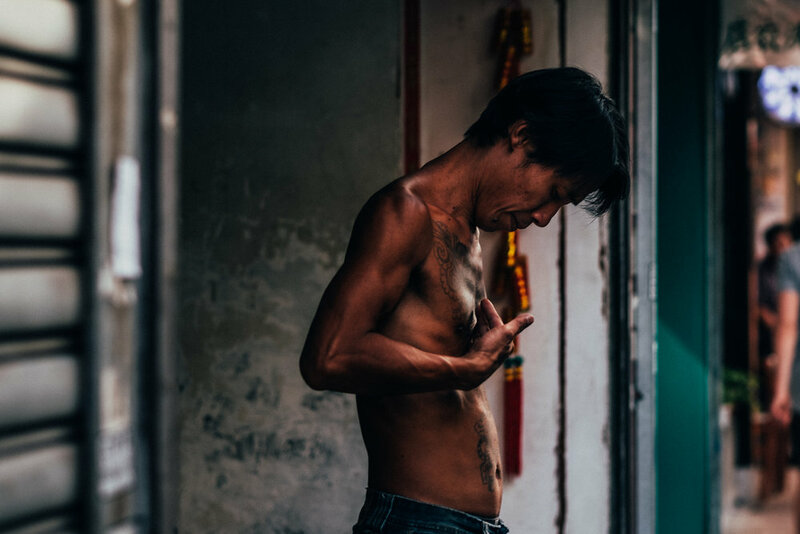 There was a moment during our stop in Hong Kong where I saw a character on the street who was covered in tattoos; he was looking around with a scowl on face and I wanted a shot of him, but I wasn’t about to go up to him and ask him for a shot, nor was he the type I would photograph without permission. I had the X-T2 around my neck with the 56mm at f1.2 and I was fortunate enough that he dropped his aggressive gaze for about 2 seconds where he looked down and touched his chest. I knew I needed to move quickly: so without even putting the camera up to my eye, trying to be discreet, I quickly snapped off three shots whilst walking. I waited until we had walked past to check the shots, and I was blown away that I managed to get the shot in focus, and at such a shallow depth of field. That was huge for me. The next challenge would be to test out the continuous autofocus function during video recording. Shooting bands on stage presents a serious challenge to the photographer/videographer because the lighting colour and intensity is always changing, and it’s a completely energetic and unpredictable scenario to be capturing. The performance is always moving and changing and there are so many variable factors at play, the interactions of the crowd and the different people on stage mean that it’s quite chaotic and you need to be quick in decision making. This is where the autofocus really blew my mind. I would set whatever lens I was shooting on to a very open f stop, mostly f1.2, f1.4 or f2. I like the look and it would help with the low light levels on stage. In continuous autofocus mode, the camera soared. I was amazed how quickly and accurately it focuses. I was initially shooting manual focus, almost too scared to trust the autofocus, but once I tried it out there was no going back. It truly shined. And it gave me the opportunity to spend more time on the framing and movement of the camera rather than worrying about the focus. Incredible. I must be frank here, there are some obvious limitations in the form factor of this camera when it comes to video. Being that it’s such a small package, and uses an APS-C sized sensor, it creates a LOT of camera shake, which is okay sometimes, but it can be distracting and unappealing for the most part. This is NOT a problem when it comes to the stabilized lenses such as the 18-135, which has really a fantastical ability to stabilize, even when fully extended at 135mm. It’s also not a problem when you’re shooting on a wide lens. Despite this setback, the internal 4K recording on this camera is astounding. It’s worlds apart from the video on the X-T1, which felt like more of an afterthought. The image quality is incredibly sharp and accurate, producing amazing quality visuals in file sizes that are manageable. We spent a lot of time shooting video in many different settings and it was sometimes about trying to capture a quick unexpected moment. The video function is easy to switch into and find the moment. I was worried about shooting with the battery grip because I had fallen in love with the small form factor of the X-T1, but honestly, I am going to be buying my own battery grip when I get the X-T2. It didn’t worry me; it added a bit more stability and weight to the camera, which I felt rather comfortable with. I have a background of shooting higher-end productions in advertising, working with very high-end expensive camera, and PL mount lenses, so I definitely looked at this camera from the perspective of whether it could be adapted to be used on professional sets, much like the Canon 5D Mark II was embraced once it had been decked out with additional add-ons and accessories. The X-T2, once properly stabilized with either a shoulder rig or steady gimbal will be a definite option for lower-budget professional shoots. My only gripe is that it doesn’t offer internal f-log recording, which would be very welcome. You need to use the HDMI out in order to record f-log. For my purposes, shooting log is key, because it gives most creative control in the grade of the final product. That being said, the other huge drawcard for me with the Fuji system is the colour reproduction, which I think is unparalleled. And that certainly follows through in the video mode. As you can see in the video we produced, there is no grading in post. What you see is what you get; we shot everything in the classic chrome film simulation, and the results are beautiful. I just wantto touch on the RAW capability of the new files on the X-T2. It’s nothing short of incredible. I was going through all my shots in Lightroom, and I noticed a shot that looked so underexposed it appeared black in the thumbnail. It was my friend trying and failing to use the camera on manual settings, which is what commonly happens when my mates try use my camera. In any case, I tried to push it up 4 stops in exposure, and suddenly I have a photo that is completely usable and with a usable amount of noise, which has an organic/filmic feel to it. That was another big jaw drop moment for me where I sort of just wanted to hug the camera, blown away by it again. Overall I cannot get over how much Fujifilm have improved the X-T2 over the X-T1, and I was truly sad to have to hand back the camera. It’s an incredible camera and I cannot recommend it enough for many, many users. I think it’s fair to say this mirrorless must be conjuring nightmares for the DSLR producers. I am counting down the days until I can upgrade.